I remember reading a bunch of articles in various movie magazines such as Cinescape and Cinefantasque a couple of months before ATLANTIS: THE LOST EMPIRE hit movie theatres. Most of the articles were gushing on and on about the producers hiring the same linguist who created the Klingon language for Star Trek to create an Atlantean language for the movie. Now, you have to wonder why the producers went to all that trouble since the Atlantean language is heard on screen for maybe 30 seconds and written Atlantean is hardly seen. And in any case, the main character translates it for the rest of the characters (and thereby for us, the audience as well), so what’s the point of going to all the trouble to invent a new language? After seeing ATLANTIS: THE LOST EMPIRE, I figured it out: the producers had to do something to justify the incredibly thin and tired story. After spending all that money on a brand new language and the animation, they probably didn’t have much left over to pay one good writer. Which may explain why there are six credited writers: my guess is that they were so bored with trying to write this story that they just passed the script around in a sort of round robin: whenever someone got tired of writing, they just passed it on to the next poor sucker in line. Milo Thatch is the grandson of the great archeologist Thaddeus Thatch and the old man has passed down his dream of finding Atlantis to Milo. However, Milo is stuck working as a janitor, frustrated beyond words because he can’t get anyone to believe his theory and finance an expedition. Maybe the fact that he has absolutely no evidence that Atlantis exists has something to do with it. And one day, outta nowhere, with no forewarning or setup, this crazy old millionaire shows up and drops into Milo’s lap a book that shows him where Atlantis is and has even built a submarine and hired a crew to help Milo find the Lost Empire. Now there are so many things wrong here that I audibly groaned when I saw this scene. But I digress….let’s just simply go on ahead with the rest of the story, okay? Milo meets Commander Rourke and his second-in-command, the beautiful and calculating Helga and a colorful assortment of multi-national specialists in various fields (doctor, communications expert, demolitionist, etc) that made me sit up and pay attention for a while since I thought that they were going to be a crew of goofy, eccentric but supremely skilled and capable sidekicks like Doc Savage’s Amazing Five or Buckaroo Banzai’s Hong Kong Cavaliers. No such luck. They’re on board mostly for comic relief, except for the black doctor and Latina teenage mechanic who actually have interesting back-stories. They get on board this way cool submarine that looks like a 19th Century prototype of The Seaview from Voyage To The Bottom Of The Sea and find Atlantis in record time, losing most of the crew and the way cool sub and from there the movie continues on a limp and predictable path as Milo finds that Commander Rourke and his crew are really out to steal the magnificent giant crystal that powers Atlantis. And I’m not giving anything away here because almost right from the first time we meet Rourke he’s whispering in ominous asides to Helga and we’re shown mysterious crates full of oversized guns being loaded on board the sub. And so Milo has to appeal to the better nature of the mercenaries to get them to change sides and help him save Atlantis from Rourke. The animation is absolutely spectacular, especially the opening sequences where we see Atlantis sink and the ending, which is a terrific action sequence, but that’s all I can recommend in ATLANTIS:THE LOST EMPIRE. At 95 minutes, it zips by in a bewildering daze. 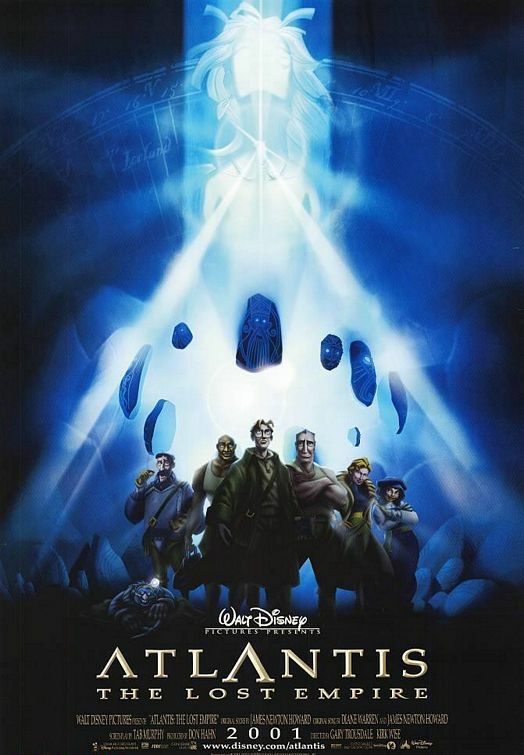 Atlantis is found in the first half-hour of the movie and there is absolutely no time to get to know the secondary characters and/or their motivations. In a desperate attempt to give the characters some dimension, the filmmakers stick in a scene where the characters sit around a campfire and actually tell Milo their back-stories. But by then, it’s too late. I wasn’t interested in what happened to any of these characters and was only in it for the eye candy of the outstanding animation work. And it’s a shame because the voice work is also quite good. There’s a real problem when the bad guy of a movie is more charismatic and appealing than the good guy, but that’s what happens here. James Garner does such a good job as Rourke that I found myself hoping he’d pitch Milo off a cliff and actually get away with stealing the crystal. Michael J. Fox is his usual energetic self as Milo. Leonard Nimoy voices The Atlantean King and there’s other familiar voices such as Cree Summer, Phil Morris, John Mahoney, Claudia Christian, Jim Varney and Don Novello all of who no doubt jumped at the chance to collect a nice voiceover check while waiting for a live action movie or TV show guest spot. It’s not that there’s anything really wrong with ATLANTIS: THE LOST EMPIRE and I realize that I’m not the target audience for this movie, but I have a hard time believing that even kids would find this material exciting or thrilling. And let’s face it…you don’t blow up a way cool sub like that in the first 30 minutes of your movie…any kid will tell you that. And there’s just too much metaphysical New Age mumbo-jumbo involving crystals and mysterious life-force energies and all kinds of mystical double-talk that does nothing but try to make you think that there’s something going on here. ATLANTIS: THE LOST EMPIRE could have been a smashing Edgar Rice Burroughs/Jules Verne type of adventure and all the right elements are there. My advice to the producers is: next time, forget about creating new languages and tell a good adventure story. My advice is to go Netflix George Pal’s “Atlantis: The Lost Continent” if you want to see a really good movie about Atlantis. Rated PG and that’s a stretch. I’d have given it an outright G.